At the time of independence, Punjabi reading and publishing were thriving in West Punjab. Based in Lahore, it consisted of qissas and cheap prints of Punjabi classics printed in hundreds of thousands. Urdu nevertheless ruled supreme, in newspapers, magazines and prestigious publishers, radio and TV. The only 'patrons' of Punjabi at the time were a couple of bureaucrats and that too on account of their tussle with Urdu speaking bureaucrats, e.g. Mumtaz Hassan and N.M. Khan etc. Punjabi was in a downward spiral, being considered an anti-Pakistan language, and branded pro-Indian and communistic. Dr. Faqir Mohammad was the lone figure fighting for Punjabi and for the 'Punjabi' monthly magazine. He did pioneering work of properly edited Punjabi classics that provided the intellectual logistics to the writers of future. The Punjabi Movement began in 1957 with the establishment of the 'Punjabi Majlis' by late Safdar Mir, an old Communist Party hand. Najm Hosain Syed, Anees Nagi, Akmal Alimi and late Asaf Khan were prominent amongst the early workers of the Punjabi Majlis. The group published a couple of anthologies of new Punjabi writings. They drew leftist/progressive writers of Urdu like Sufi Tabassum, Shazad Ahmed and others. Faiz sahib was also approached. This was the scene when a short thin lad from Warburton Shiekhupura arrived in Lahore. His name was Mohammad Sadiq. This slip of a boy called himself 'Raja Rasalu', the legendary younger brother of Puran Bhagat of Sialkot. The nom de plume might have sounded hoary and comic then, but bode true of acts to come. A lover of his mother tongue, the Punjabi language, he joined the Punjabi Fazil class at the tuition centre being run by Aqa Bedar Bakht near Delhi Gate. There he met and befriended Professor Asaf Khan who was studying for Persian Fazil. They were to remain lifelong friends and stalwarts of the Punjabi Movement. Asaf Khan was a recent convert then, and a great scholar of Persian, Sanskrit, Hindi, Urdu and Punjabi. Raja Rasalu was a willing assistant and a committed activist. He was free of any ego problems and a fiery, zealous and tireless worker, a friend of everyone and anyone who loved or worked for Punjabi. Our October revolution of 1958 -- Ayub Khan's martial law -- had hit Pakistan. Punjabi Majlis was banned. Meanwhile, another pioneer of the Punjabi movement, Shafqat Tanveer Mirza, who had formerly worked for C&MG, Nawa-e-Waqt, Pakistan Times, Imroze, started Majlis Shah Hussain in Lahore. Raja Rasalu was his indispensable assistant. 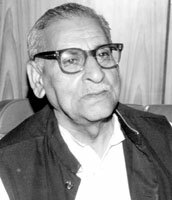 The association lasted till the day of Raja Rasalu's death in October 2007, when he was Secretary/Chief Executive of Pakistan Punjabi Adabi Board, where Shafqat Tanveer Mirza is the President. In the early sixties, the Punjabi Academy was formed by Dr. Baqir doing publishing work in Punjabi, with financial help from Mr. Mumtaz Hassan of National Bank. The Punjabi Adabi Sangat was formed and started meeting weekly at the YMCA. Punjabi workers like Najm Hosain Syed and Akbar Lahori were attending regularly. Raja Rasalu was the man who kept this Sangat going. When it defaulted in rent payment, he found a sympathetic Christian connection in the likes of one Joshua Fazal Din. He sustained the meeting even when attendance thinned down to one or two and kept a record of every meeting. When Majlis Shah Husain wanted to launch the first text of 'Kafian Shah Husain' he brought the legendary Inayat Bai Bhero Wali from the cold. She held the audience spellbound with her rich and powerful voice and sang Shah Husain from memory. Many a future writer/worker of the language was inspired by the magic of her voice and converted to the cause of Punjabi. Masud Sadiq, then a senior adviser/minister in West Pakistan declared that Punjabi should be the medium of instruction in Punjab, a wish that remained unfulfilled. Lesser souls were to be disheartened by the hostility of the government and a largely unaware public to this cause, but Raja Rasalu never deterred. He cycled around town to bring people to the meetings of Punjabi Majlis, then Majlis Shah Husain and the Punjabi Adabi Sangat. Till a week before his death he was present with the third generation attendees of the Adabi Sangat. When Shafqat Tanveer Mirza, the elected Gen. Secretary of Punjabi Sub Region of Writers Guild was fired by Qudratullah Shahab for political activities, Raja Rasalu started officiating and served till the day of his death. When Professor Asaf Khan passed away after serving for twenty years as Secretary of Punjabi Adabi Board, Raja filled in and remained Secretary till he lived. Even when not the boss, he was the indispensable assistant, martialling men and material. For anyone who is acquainted with political work, whether social or cultural, would know that the spine is provided by practical, dedicated and committed workers. Raja Rasalu had a warm, loving and friendly disposition and a selfless nature. He was versed in all of Punjabi literature, old and new and would write when the need arose. Towards the end of his life he collected and published his own poetry, 'Mein Tan Dard Awalley'. He was in the middle of writing his autobiography which was being serialised by the Punjabi magazine 'Saveyr'. Early in life he published a collection of Punjabi nursery rhymes 'Lorian'. When I accompanied a shattered Shafqat Tanveer Mirza to Raja Rasalu's funeral, I did not inform Najm Hosain Syed as he was himself recovering from a serious bout of pneumonia. At the funeral I was to meet Najm, son of late Asaf Khan and another Najm, son of Raja Rasalu, both lovingly named after Najm Hosain Syed. Shafqat Tanveer Mirza, Najm Hosain Syed and Raja Rasalu had been active in every Punjabi movement endeavour and project. But a movement is sustained by teamwork. While Najm has been the moving spirit behind us all, and is teacher and mentor to most of the Punjabi writers of today, Asaf Khan, Shafqat Tanveer Mirza were always in the forefront, and carrying forward the movement on his shoulders was Raja Rasalu. No one ever learnt what utter poverty he faced in his life or how he brought up his large family. His is a story too good to be true! He could write and versify but left it to those who could do it better, whom he loved and avidly read. And here was a vignette of Punjabi movement in Pakistan: Hundreds of his neighbours bidding farewell to their friend and loving helpmate, and many Punjabi lovers mourning a great soul and servant of the language.